I've totally slept on this... and my apologies go out to Scott and Colin for my ineptitude. 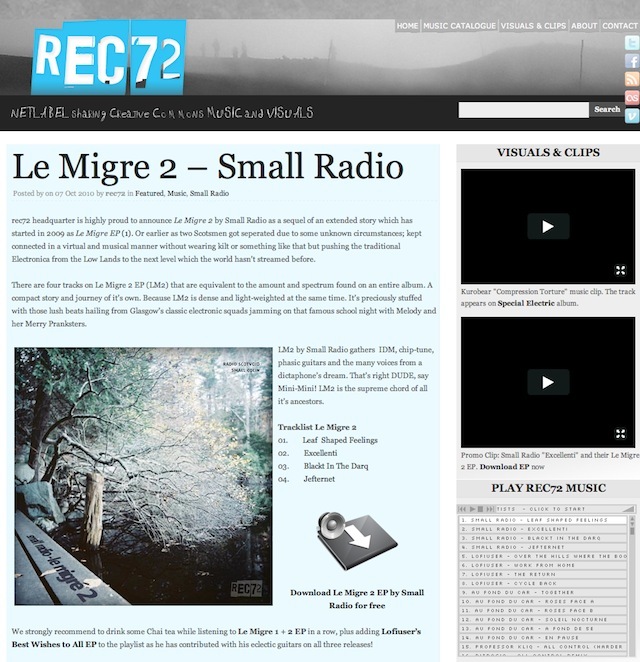 Scott Buchanan, 50% of Small Radio and 100% of Radio Scotvoid, gave me a pre-release of their latest ep :: Le Migre 2 :: and told me to keep it to myself... so that's what I did, literally, when in fact I should have been shouting at the top of my voice as to how good it was. Le Migre 2 is a wonderful genre-defying slice of electronic music that is bursting at the seams with ideas - found sounds, piano, distorted guitar, weird hyper-Scottish vocal samples, glitchy drums sequences, luscious synths - the EP is alive with sound in such a varied manner that it keeps you on your toes... like someone sleeping in the jungle for the first time, jumping at the each and every new sound. This modern day "wall of sound" is a delightful addition to the albums on my iPhone and one that I would heartily recommend. I just hope the creativity on display is infectious... because I want some! The only thing that disappoints is the length... 19 minutes just isn't enough... I don't feel satisfied... I want more.